[Steve Brill] doesn’t care a fig for the hospitals, which are the villains of his story. Rather he rejects Medicare expansion because if Medicare expanded, “no doctor could hope for anything approaching the income he or she deserves (and that will make future doctors want to practice) if 100% of their patients yielded anything close to the low rates Medicare pays.” It’s true that many American doctors do believe that they would be crushed if they were paid only Medicare rates. They insist they’re hard-pressed as it is, barely getting by, and practically treat these Medicare cases as acts of charity. There’s no way they could swallow those reimbursement rates without the whole system collapsing. The last time the OECD looked at this, they found that, adjusted for local purchasing power, America has the highest-paid general practitioners in the world. And our specialists make more than specialists in every other country except the Netherlands. What’s even more striking, as the Washington Post’s Sarah Kliff observed last week, these highly paid doctors don’t buy us more doctors’ visits. Canada has about 25 percent more doctors’ consultations per capita than we do, and the average rich country has 50 percent more. This doctor compensation gap is hardly the only issue in overpriced American health care—overpriced medical equipment, pharmaceuticals, prescription drugs, and administrative overhead are all problems—but it’s a huge deal. Now I’ve rambled on this in a tuss before. My previous commentary on such is emotional and, admittedly, applies to but a small minority of health care interactions. As the recession has shown us, much of health care is not so urgent. That said, I still stand by the gist of my original argument. I think some responses to Steve Brill’s piece, and indeed to those who would try to medianlize physician income, are making leaps of illogic. Article’s like the one by Matt Yglesias at Slate, linked to previously and titled “America’s Overpaid Doctors,” and this Weekly Standard piece I linked to months before are examples of such. It’s easy to see why a health care provider is almost uniquely well-positioned to bilk you. If you don’t get treatment, you or someone you love might die. It’s a high-pressure emotional situation that makes it extremely difficult to bargain, comparison shop, or just decide to cut back. But the starting point, almost universally it seems, for arguing against the current level of American physician earnings is that American physician earnings are vastly incongruent with some implied international market. The conclusion; the assumption that American physician pay should be more in line with the rest of the world is loopy. It certainly isn’t effectively argued by merely comparing American physician earnings against the earnings of their international counterparts. It’s silly to say that international comparisons of physicians earnings provide an argument for lowering American physician payments, implying a market value for physicians, when the market doesn’t really exist because international physician compensation is centrally dictated. I assert that the rest of the world’s physicians earn too little and in a less dictated market they would earn much more. There is a massive disparity of information and at times an acuity to choices in health care that in a free market would potentially elevate physician earnings. Indeed, my previous post is dedicated largely to hypothetical situations where the above, and thus physician earnings, would be maximized in a truly free market. But to call such situations a “bilk” is ridiculous; that’s the way markets should work. ZiyadMD has a blog with a great post on American physician earnings. He notes that other advanced countries deliberately consider how much physicians should earn when setting payment levels, which runs against American free-market ideology. “What they come out with has to be seen as fair in terms of the overall income of doctors relative to each other and to the rest of society,” says Dr. White. 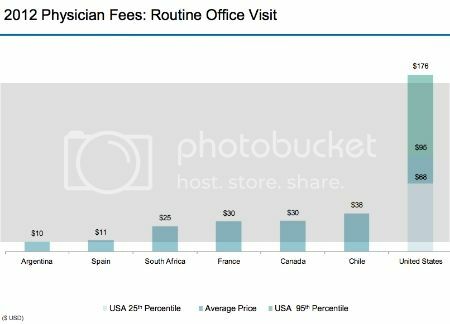 Of course, international comparisons are tricky because US practice costs, including overhead and liability premiums, are much higher, and educational expenses for US physicians are considerably greater than in other advanced countries where medical school tuition costs are heavily subsidized. But the income differential for US physicians significantly exceeds those higher costs. According to an article in the September 2011 issue of Health Affairs, the income difference after practice expenses between US and British orthopedic surgeons in 2008 was nearly 5 times the difference in education repayment costs, meaning that US physicians are earning compensation in excess of what they’d need to pay back medical school debt. I concede, and have before, that there are many things un-laizze faire in American health care and yet work decidedly in physician’s favor. Chief amongst them licensure and scope of practice issues. And I want to note I am not disputing the earning of American physicians as compared to their international counterparts. Here you see citations for practice costs and the cost of medical education as why American physicians should earn higher. That argument is just as bonkers. I concede, despite the higher costs of practice and the costs of medical education, that American physicians earn much more than their conterparts around the world. It isn’t that American physicians are overpaid though. It is just that the rest of the world is underpaid. You mention the cost of practice, and few realize how staggering it is. I am in a group practice in emergency medicine. I am not a hospital employee. Thus, I pay all of my benefits and fees. My own health insurance, disability, malpractice; my own retirement, my own licensure, continuing education, uniforms, meals, everything comes from what I earn. I think people look at physician salaries and think they’re always in addition to normal work benefits, which they often are not. Thanks for your excellent discussion here.